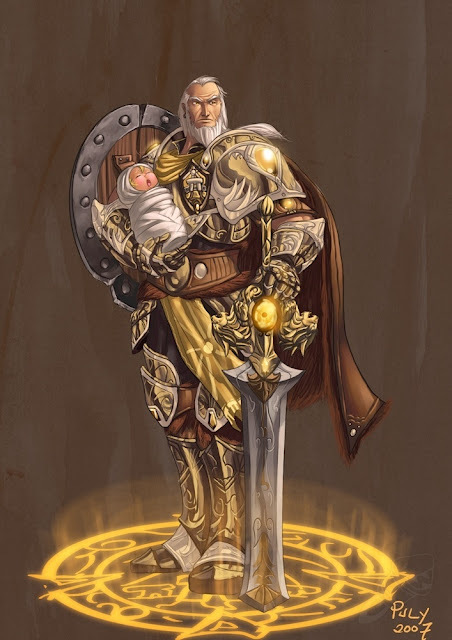 · Weapons & Armor: Light & Medium armor; Shields. All weapons allowed. · Battle Die/BD (Optional): If you are using the optional Mass Combat Rules, Captains provide a +1 bonus to BD roll and +2 at 10th level when leading troops in combat. · Commands: Each captain get to specialize at 3 different & distinct categories of shout commands. The ones based at the offensive values, defensive ones and finally the utility ones. Captain must choose to allocate UD of d8, d6 & d4 to each category to emphasize their specialization. Each shout, when indicated, has duration of 1 round per Captain Level and each shout must be tested accordingly to each UD allocated. Each command is considered a Swift & Free action but is limited to one at a time. Silence will hinder captain’s abilities as much as surprise attacks (Storyteller’s discretion). Commands can be heard up to Nearby zone (60ft). There is no limit of how many people can be affected by each command (How many people fit to a 60 feet area? ), but those storytellers who need an indicator we can assume that each command affect to a maximum of 1 person per captain’s level. Every time a Command is been used roll the correspondent UD; when 1-2 is rolled drop one step. When you roll a 1-2 on a d4 the Command is expended and the character has no more of it left. Commands will replenish after a long rest (8 hour). · You will die: For the duration of the command when the attack roll is equal or under the indicated ability (as success) and equal to or less than your level; you make a Power Strike. This increases the damage die by one step (max Attack Damage is d12). · Charge: Each ally at earshot gain a free attack. All the attackers must be able to act at the same round. Duration: Instantaneous. · Feather your Foe: You success at the Initiative Check. Duration: Instantaneous. · Stand your ground: For the duration of the command, each target at earshot gains 1 HP per round. · Shake it off: Offers a second chance. Each target gets a new Saving Throw against any ongoing condition. Duration: Instantaneous. · Watch yourself: For next 1 round per captain level; heroes gain Advantage to Defense rolls. · Don’t Die On Me: For 1 round per captain’s level each hero who drops at 0 HP gets 2 rolls at Out Of Action Table choosing the best result. · Move, Move, Move: The Captain chooses 2 willingly target from Close until Far away (0ft-120ft). These targets shift immediately positions. Unconscious targets can also be affected. Duration: Instantaneous.